The now-notorious NY Daily News is once again doing the bidding of jihadists, and in this particular case, Hamas. According to the Islamic apologists over at the NY Daily News, it’s “outrageous drivel” to call attention to Hamas’ genocidal rhetoric. 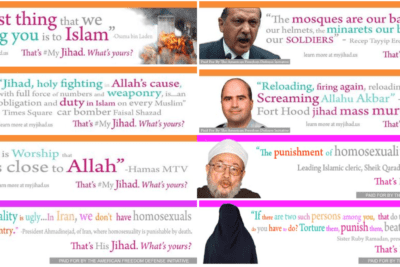 The terror-linked group CAIR had an ad campaign “rebranding” the word jihad (http://myjihad.org/). They mean to make it into something soft and fuzzy. Our ad campaign is a response to their campaign. The NY Daily News has no problem with this. They are outraged by our ads. Back in January 2010, I wrote a piece for Breitbart exposing the sharia-compliant policies of professional journalists. The Society of Professional Journalists (SPJ) issued this directive a couple of weeks after 9/11; for sheer propaganda, their “Diversity Guidelines” are hard to beat. In fact, the enemy who attacked our country in an attempt to bring it down may just as well have been writing the narrative. Today’s media has given new meaning to the term “yellow journalism.” Yellow as in cowardly. The Daily News means they will be offended at Pamela Geller, of course, not at Hamas. They should be offended at Hamas, if what we’re constantly told about the vast majority of Muslims being moderate, democratic, tolerant and pluralistic were true. They should see the ad and call upon Hamas and other Muslim groups to stop the jihad against Israel, drop the genocidal rhetoric, and teach against Islamic antisemitism in mosques and Islamic schools in the U.S. The Daily News should be calling upon them to do those things. Instead, it smears Pamela Geller as a “hatemonger” (in the photo caption) for pointing out that this genocidal antisemitic statement was made, and that nothing is being done about it. After being forced by a court to run an inflammatory, anti-Muslim ad on the city’s buses and subways, the Metropolitan Transportation Authority aims to get out of the political advertising business. With sympathy for the MTA’s tough spot, the agency is mistaken in trying to eliminate issue-oriented ads as a way to swat one annoying gadfly. What, he isn’t? Where? When? Understanding that the message would offend many Muslims and arguing that it might even incite violence, the MTA rejected the campaign. Why would the ad offend many Muslims? Because they condemn Hamas and its genocidal rhetoric, and back up their condemnation with real action to teach against these attitudes in Muslim communities? Where? When? Do they have a different idea of jihad and consider Hamas and its antisemitic jihad to be un-Islamic? Even if that were true, Hamas presents itself as Muslim group waging jihad in cause of Islam, and justifying its actions by referring to Islamic texts and teachings. Do Americans not need to know this? Does no one need to call attention to it or endeavor to counter it? Everything the ad says is true: Hamas made this statement, and did so in the context of jihad. Muslims who oppose this view of jihad and this hateful antisemitism should be siding with Pamela Geller and criticizing Hamas, not her. And the Daily News should be more concerned about the fact that there are Muslims who actually believe this than about the Muslims who claim to be so offended by it that they want it off the buses, but don’t lift a finger to counter these attitudes within Muslim communities. And the idea that it “might even incite violence” is also nonsense. The ad ran in San Francisco and Chicago without incident. The MTA claimed it would incite violence but could not adduce even one example of its doing so. And the violence would be from Islamic jihadists who would presumably mistake it for a pro-jihad ad. You’d have to be quite dim to do that, but if someone did, the focus should be on protecting people from violence, not on curtailing speech in light of the possibility that violence could ensue — for once we do that, we enable any thug to shut down any speech he dislikes by threatening violence over it. …It’s well and good, and constitutional, to ban ads that could reasonably incite violence — say, with mocking images of the Prophet Mohammed. In this, the Daily News is essentially counseling surrender to the jihad. Instead of standing up against violent intimidation, the Daily News is saying, Give in to the bullies and thugs. They will kill us if we say something they dislike, so let’s not say anything they dislike. That is the coward’s way, the path of capitulation and submission. What ever happened to, I disagree with what you say, but I will defend to the death your right to say it? Gone and forgotten. And so also, before too long, will be our freedom of speech, and with it our other freedoms. Beyond that, viewpoints should be welcome. New Yorkers are big boys and girls. If swallowing some outrageous drivel is the cost of preserving other worthwhile advertising in one of the city’s most important gathering places, so be it. One hater shouldn’t spoil things for everyone else. So it’s “outrageous drivel” now to call attention to Hamas’ genocidal rhetoric. Which only ensures that we will get more such rhetoric.